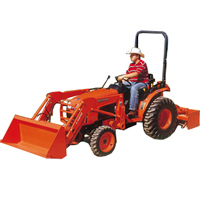 Power – This tractor comes equipped with a 915 cu in engine producing 30 horsepower @ 2,800 rpm. Compared to the average compact tractor which produces 41 horsepower, this model produces 30 hp, 26.8% less, certainly worth noting if you intend to use your machine for any strenuous task. In addition, the engine produces 25 power take-off (PTO) horsepower, 24.2% less than the compact average of 33 hp, placing it near the lower bound of power available for implements. Lift Capacity – With a lift capacity of 1,435 lbs, this model can only lift 40% as much as the average compact, which lifts 2,383 lbs, a major concern if using a loader is integral to your decision. Speed – The L2800 can travel at a maximum speed of 14.7 mph, 0.8 mph slower than the average compact, which can travel at a maximum of 15.5 mph, worth noting if traveling to and from a worksite is an important factor in your decision. 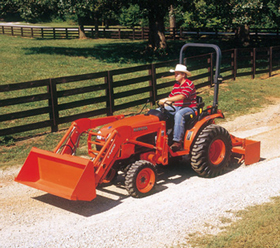 Transmission – This Kubota comes standard with a 8 forward-speed hydrostatic transmission and a clutch. The average compact tractor’s transmission features 9 speeds while this model features 8, which is 1 fewer than its average competitor, meaning it may not be ideal for work that requires a very precise speed. Operating Weight – An average compact tractor weighs 3,527 lbs while this model weighs 2,403 lbs, 32% less than its average competitor. If working on loose ground is integral to your decision, this model is certainly worth considering. Total Displacement: 91.5 c u.in.